Hugo Fox in fourth following George King and Joe McGhee, in first and second. and a double SAAA Championship winner. After the lean years of the War when training was at a minimum where it was possible at all, with the help of the Scottish Marathon Club and information passed on from many sources not least the ‘Scots Athlete magazine where Walter Ross printed articles on training and from Percy Cerutty and others from Australia, Arthur Newton from South Africa as well as from America and even England runners began training really seriously. Joe McGhee was the big name. Starting from St Modan’s in Stirling he moved to Shettleston Harriers and went on to win three SAAA titles in succession and of course the Commonwealth Games Marathon in Canada. His career and the Vancouver Marathon are dealt with elsewehere. He was the tip of the iceberg – there were several good men and coincidentally three of them came from Shettleston – the others being Harry Howard and Hugo Fox. Hugo is here as an example of this new breed of hard training marathoners. 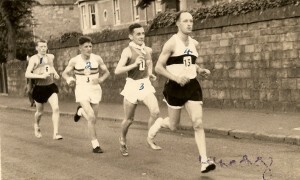 Hugo Fox was third in Joe’s record breaking marathon in 1955 and then had to miss a year through injury. When he came back at the age of 36 in 1957 he was second to Harry Fenion ( a wee quirk here too – his time of 2:28:57 was identical to that of his second Championship victory) and then when he won it himself in 1958 at the age of 38 in 2:28:27 for the third fastest SAAA winning time ever. His second victory in 1959 was his last title victory. Colin Youngson who co-authored the excellent ‘A Hardy Race’ with Fraser Clyne continued to receive information about some of those who were featured in the book and in 2002 wrote the accompanying article. When in 2000 Fraser Clyne and I published our book about the Scottish Marathon Championship (‘A Hardy Race’) we were concerned that in spite of careful research there might be a host of inaccuracies which would be brought to our attention by irate runners or their relatives. To our relief few have been received. The most recent facts are about the late Hugo Fox of Shettleston Harriers who won bronze in 1955, silver in 1957, was the winner (and a Commonwealth Games representative) in 1958 and retained his title in 1959. Hugo’s sister-in-law, Mrs Cathie McBrearty, lives in East Kilbride. Someone told her about the book, she got in touch and a copy was sent to her sister, Hugo’s widow, Mrs Phil (Philomena) Fox who lives in New South Wales, Australia. I was delighted to receive a fascinating letter, photos and cuttings about Hugo and his marathon running exploits of more than forty years ago – and decided to write this article for the Scottish Veteran Harriers magazine. Mrs Fox corrected three of my errors for a start. 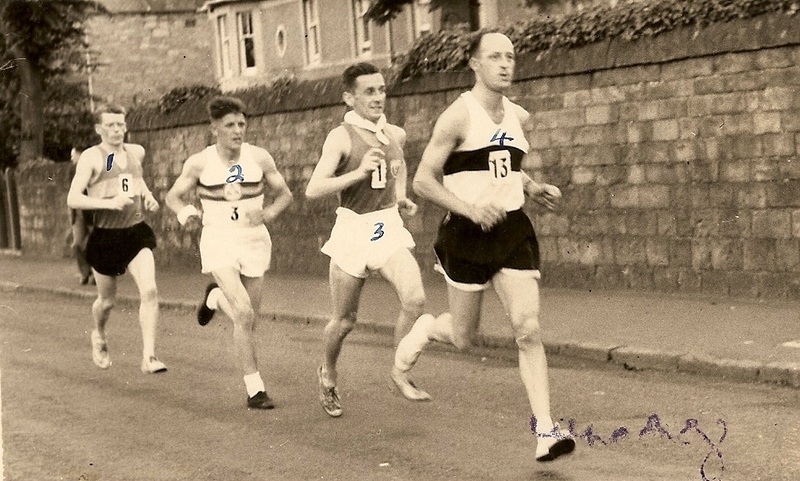 The cover picture (of the lead pack at five miles in Harry Fenion’s 1957 marathon) actually shows Hugo (head and shoulder shot) concentrating hard at the back of the group , conserving his energy for later. He is fourth from the left and not as indicated on the inside cover. Hugh Mitchell suggested that Hugo never wore socks – but Mrs Fox asserts that, while he didn’t wear them for running, he always wore them when dressed properly. Harry Fenion, after losing to Hugo in the 1958 race is meant to have said that Hugo had been on the dole for nine months and had plenty of time to train. However Mrs Fox makes clear that Hugo was actually working a five day a week in the heat and dust of a foundry, plus two nights a week overtime, as well as running up to 130 miles a week! In 1965, well after these marathon running days, Hugo was on a four day a weekfor thirteen months – and the lack of work was the reason for the family emigrating to Australia in 1966. Hugo had been a keen cyclist with a number of Glasgow clubs for fifteen years when he married in 1952. Although she didn’t share his enthusiasm for cycling, and he gave up that sport, Mrs Fox certainly sacrificed a lot for her husband’s next hobby which he began just to keep fit around the beginning of 1954. In fact she was the one who said “Why don’t you join the Harriers and do some running?” He was 33 years old and his Shettleston clubmates, welcoming but blunt, thought he was too old to be much good. Hugo retorted that the thought of his age never crossed his mind – and obviously set out to prove the pessimists wrong. As I wrote in ‘A Hardy Race’ the legend has it that when in the 1958 Scottish Marathon Hugo Fox arrived in the lead outside the old Meadowbank track, en route from Falkirk, he found the six foout spiked gate at the north end had not been opened by the park keeper. Undeterred, Hugo climbed over without impaling himself and strode onto the track to claim his title in a finishing time of 2:31:22, still over a minute clear of Alex McDougall (Vale of Leven) who was allowed to enter via the gate which had now been unlocked. Harry Fenion (Bellahouston) was third. Mrs Fox sent photocopies of photographs showing Hugo leading on a lonely stretch of the Shotts Highland Games road race; proudly wearing his Scotland tracksuit at the Dunblane Highland Games; and in the marathon, Hugo passing her outside the park and running strongly to the tape. There is also a photograph of the entire Scottish squad at the Cardiff Empire Games where due to unbearably hot conditions and a dreadful ‘stitch’ Hugo was forced to drop out of the marathon along with Harry Fenion. Nevertheless he was in fine form in 1959 when he led the Scottish Marathon from start to finish over a minute in front of Gordon Eadie (Cambuslang) and Jackie Foster (Edinburgh Southern). After his second victory the Fox family moved to East Kilbride but he still trained by running the 13 miles to work each morning and back again at night – a marathon a day! Then at the weekend he had time for a longer effort of 30 miles. His dedication was truly fantastic and many full time athletes and good class amateurs nowadays must feel that by comparison they don’t try hard enough. Sadly six years after arriving in Australia Hugo was found to be suffering from stomach cancer although he was only told that he was suffering from an ulcer. The operation removed a large growth which, the specialist told Mrs Fox, had been developing for twenty years. In other words, before and during his entire running career. Mrs Fox wonders whether the agonising ‘stitch’ which forced such a tough competitor out of the Cardiff Marathon was in fact caused by the cancer. Normally he would ‘run through’ discomfort so this must have been exceptionally painful. Nevetheless after the operationm Hugo was typically determined to get fit again, having been off work for four and a half months. He started walking and three months later could manage ten miles a day. the doctors were amazed when he was back at work four and a half months after surgery. Sadly his recovery was temporary and Hugo Fox died in 1974. I think that the above covers everything that we want to know – or have a right to know – about Hugo Fox. Thanks, Colin. I attach as a couple of appendices the ‘Sunday Post’ article referred to above and the extract from ‘A Hardy Race’ that are referred to above. I like the juxtaposition of the 6000 miles a year man with the ad for Capstan! Hugo had been a racing cyclist before he changed to running. Once when he had moved into a new tenement flat with his wife and young family, Hugo set out to explore his new neighbourhood. He was so anxious to discover new running trails that he became badly lost and did not return until three hours later. When he checked the map he found that he had run more than thirty five miles. Hugh Mitchell, Hugo’s clubmate and another converted cyclist remembered that Hugo worked as a metal moulder and never wore socks – even when dressed up! Hugo had shown his strength as a cyclist by winning specialist events involving sprinting up a one mile hill. Another memory from Mitchell is of the Morpeth – Carlisle event with the more experienced Hugo. Mitchell ate steak before the race while the more experienced Fox preferred bread and jam. When Hugo ran much better than Hugh the latter learned a lesson. Jimmy Irvine of Bellahouston remembers Hugo Fox as a specialist marathon runner unlike Harry Fenion who Jimmy considered classier but inconsistent. Hugh Mitchell has the tale about his first trip to the Morpeth to Newcastle Road Race with the more experienced Hugo. Mitchell ate steak before the race and the more experienced Fox had bread and jam. When Hugo ran much better than the Hugh, the latter learned a lesson. Hugo Fox had the experience in 1958 of arriving in the lead during the championship at the six foot spiked gate at the north end of the old Meadowbank track only to find the park keeper had not opened it. Undeterred Hugo climbed over without impaling himself and trotted on to the track to claim his title in 2:31: 22. In 1959 when the race was from Falkirk to Meadowbank, Fox who was a good judge of pace raced into an early lead and by half distance was several minutes in the lead. By twenty miles the chasing pack was reduced to Gordon Eadie of Cambuslang who was closing in the later stages but Fox won by over a minute from Eadie.